Today we continue our series on tax complexity with a map showing the hours it takes businesses across Europe to comply with labor taxes. Tax complexity imposes a real cost on businesses and the economy. Complex tax codes require firms to devote resources to tax compliance instead of doing other productive activities. Although labor taxes are not necessarily borne by businesses, they can add to the administrative burden of complying with the tax system. The number of hours it takes businesses every year to comply with labor taxes (including social contributions paid by employers) is one way of measuring this administrative burden. The time to comply indicator reflects the average number of hours it takes a medium-size business per year to prepare, file, and pay labor taxes (including social contributions), as measured by PwC’s “Paying Taxes 2018” component of the “Doing Business” report from the World Bank. Luxembourg’s labor tax compliance requires the least amount of time of all European countries covered, at 14 hours, followed by Norway, at 15 hours. In contrast, in Italy and Hungary, businesses need 169 hours and 146 hours to comply with labor taxes, respectively. In other words, businesses in Luxembourg and Norway invest only about one tenth of the time their Italian and Hungarian equivalents do, reflecting the substantial differences in labor tax complexity across European countries. Another indicator of labor tax complexity is the number of separate labor tax payments (including social contributions) a business is required to make every year. This indicator also accounts for easier compliance through electronic filing. When a labor tax is paid and filed online by the majority of medium-size businesses, only one payment is included in the indicator (even where payments are made more frequently). While Estonia’s labor tax payments are automated, most European countries covered file labor taxes either once or twice every year. Businesses in Luxembourg and Iceland are required to make the highest number of labor tax payments, at 12 and 13, respectively. 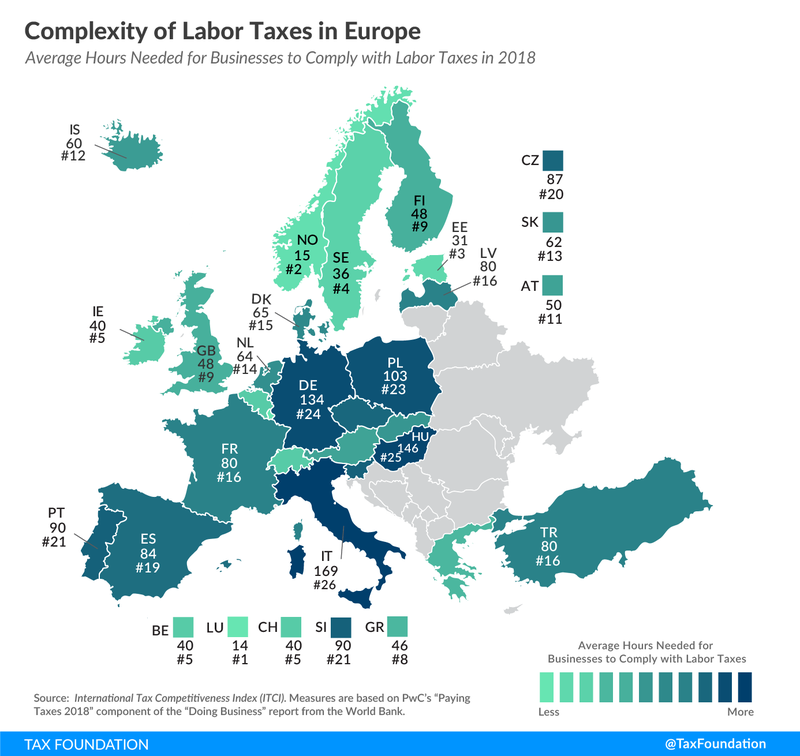 Both measures, compliance time and payments, show that in some European countries businesses face a relatively high degree of labor tax complexity. However, in the case of labor taxes, this is only part of the total administrative burden. Adding the time individuals invest in preparing, filing, and paying their individual income taxes and social contributions would increase many countries’ labor tax compliance measures substantially. Next week, we will continue our series on tax complexity by examining compliance time associated with Value-Added Taxes (VAT) in Europe.